Sat., March 2: 9-10:30 a.m. Drop off your paintings. Reception: Thurs., March 7, 5-7 p.m.
Fri., March 29: 9-10:30 a.m. Pick up paintings. Paintings cannot be removed before the end of the show. Entry fee: $20 for 1-3 paintings. No refunds. 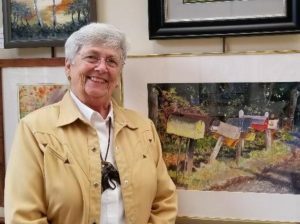 Kathy is an award winning artist who has earned signatures in several watercolor societies including NWS and a Master Signature in the Louisiana Watercolor Society. Her paintings have been published in Watercolor Magazine , Best of Watercolor: Painting Light and Shadow, Splash 8, Confident Color by Nita Leland and The Artistic Touch 4 & 5 by Chris Unwin. Fill out and bring/send with your paintings. No jpegs needed for entry. Titles and price s are needed by Feb. 22 so that title cards can be printed for you. Email your info to LWSart@yahoo.com. Paintings must be new to our member show and never shown before at the Archives or in the LWS Juried Member Show. 2019 dues must be paid to participate in member shows. Original watercolors on paper, neutral mats, plexiglass and wired frames (maximum size 52″). 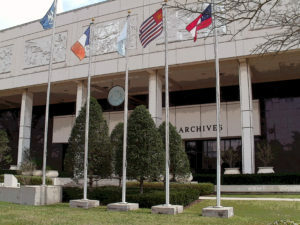 Since the Archives is a State building, all art must be suitable for viewing by people of all ages (no nudes). Workshop paintings, including copies repainted after the workshop, are not allowed. Entering this show means that you agree to all the guidelines established by LWS.